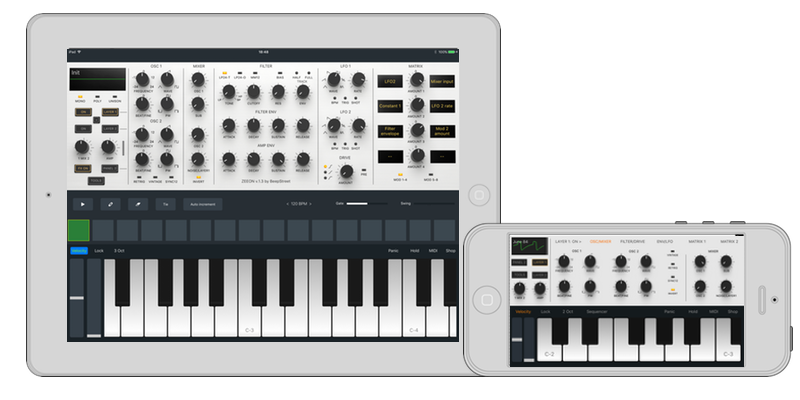 Audio Unit v3 and standalone application with a simple polyphonic step sequencer and full MIDI implementation. 2 oscillators with continuously variable waveforms, hard-sync and sub-oscillator. Carefully simulated analog drift and PSU influence. Filter: 3 models available: Transistor ladder low pass, OTA cascade low pass and State Variable Filter with continuously variable LP-HP + BP mode. 2 low frequency oscillators and envelope generators per voice. Overdrive: diode clipper and transistor saturation, pre and post filter. Up to 2 layers per voice. Layers can modulate each other. Powerful modulation matrix offering self-modulation and cross-layer modulation, 8 modulation slots, 17 signal sources and 41 targets available, both from modulation modules and audio signal path. This takes Zeeon into semi-modular territory. Imagine oscillator waveform, panning, filter cutoff, resonance or LP-HP mode modulated by oscillators or another layer! Effects unit: Circuit modelled BBD chorus, bass booster, zero-delay Phaser, Stereo delay and Reverb. 144 presets and Tutorials bank, additional banks available as IAP's. 64-bit iPad or iPhone is required. Zeeon solves millions of nonlinear equations in every second. Despite of heavy optimisations (DSP engine is written in assembly language for powerful ARM Neon) this comes at the cost of quite a high CPU-hit (40-50% on older devices), but we think the sound is worth it.